The regrettable fact is that most shoes sold in the United States aren’t recyclable. Most shoe recycling programs are simply shoe redistribution programs. But there are some shoe manufacturers that believe in closed-loop recycling to reduce the use of virgin material and to prevent old shoes from becoming environmental waste. One manufacturer who just made a positive step is shoe giant Adidas. They have joined forces with Parley For The Oceans to unveiled their first prototype product—a shoe upper made entirely of yarns and filaments reclaimed and recycled from ocean waste and illegal deep-sea gillnets. The use of gillnets has been outlawed by many conservation groups, including the Conservation of Antarctic Marine Living Resources (CCAMLR). Many have specifically expressed concerns over the impact of this fishing method on today’s marine ecosystems. Gillnetting is commonly used by commercial and small-scale fishermen of all the oceans and in some freshwater and estuary areas. The vertical panels of gill netting are normally set in a straight line. Fish are caught by gill nets in three ways: held by the mesh around the body; by mesh slipping behind the hard bony flap covering and protecting the gills, or tangled by their teeth, spines or other protrusions without the body penetrating the mesh. Fish most often swim into a net and pass only partly through the mesh. When fish struggle to free themselves, the twine slips behind the gill cover and prevents escape. To help stem the tide of illegal gillnet fishing, Sea Shepherd retrieved many illegal nets during a 110-day expedition that tracked an illegal poaching vessel. 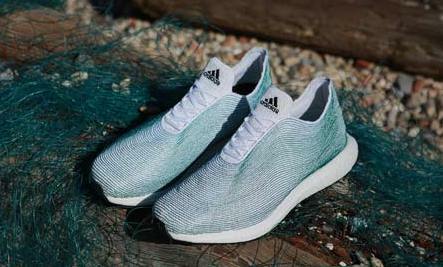 Adidas and Parley for the Oceans then used those nets to create the shoe sample. For the past year and half, a coalition of groups associated with Stop Gillnets Now have been closely monitoring the use of illegal gillnets. We can only hope that more people and manufacturers take action to protect our fish and safeguard the health of our oceans.